High-rise apartment buildings are at a disadvantage; if they have a clear line of sight to a street then it’s likely the noise from the street can be heard. So even on the 20th floor you’ll hear the noise of a car or truck as it passes by. The noise from street “bounces” off the buildings creating an echo effect so the noise on higher floors is many times louder than lower floors. On the plus side, compared to houses and townhouses, apartments have fewer sides exposed to the outside and, therefore, fewer entry points for noise. The goal of apartment sound insulation is to improve the noise levels by at least 5 decibels, and preferably by as much as 10 decibels. A 5-decibel improvement is “noticeable”, but not greatly beneficial. Whereas a 10-decibel improvement is subjectively about “half as loud” and considered very beneficial. For comparison, closing windows in a room typically produces a 10-decibel reduction in noise. 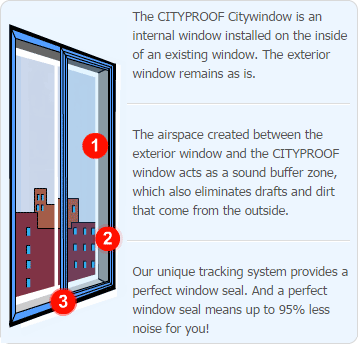 Cityproof’s soundproofing solution is ideal because your original windows will remain in place and the additional soundproofing material is practically invisible. External sounds are reduced significantly, dirt infiltration is practically eliminated, and the additional insulation means lower energy bills. So whether you’re hoping to block noise from traffic or construction, Cityproof can help.